Promise of Blood, the first book of Bryan Mclellan's The Powder Mage Trilogy is one of the best fantasy debuts of 2013. Set in the aftermath of a successful coup d'etat, the novel follows the fates of a ruthless usurper, his marksman son, and a skilled detective as they weather the political storms that wrack the kingdom. Betrayal and murder lurk in every corner as individuals and groups, with their own insidious agendas, squabble over the ruins of Adro. Amidst the chaos, Tamas, Taniel and Adamat must make unlikely alliances and break long-standing bonds in order to stop a god from annihilating their country. Promise of Blood is a tightly-written and magnificently crafted work. For me, an author's ability to create a world isn't in what he or she shows, but at what the writer hints at and hides. Brian Mclellan crafts a book with explosive characters, a great setting, and a magnificently woven plot. But there is still a richness in the material waiting in the shadows, the ones hinted at in bits and pieces found in the character's dialogue, which makes the Nine Kingdoms all too real. From start to finish, the book is a dusty journey undertaken at breakneck speed. Starting with the aftermath of a coup is perhaps one of the best ways to start a fantasy novel. As the dust settles, characters are exposed at their most vulnerable state -- raw, edgy and just plain tired. Then the chaos follows as factions fight over the pieces, all the while unaware that a greater threat looms. Brian McClellan has created distinct characters that have the potential to live on in the fantasy genre's lore. This isn't just true for the main characters. My favorite, Olem, is a bodyguard who loves smoking, can't sleep and has a wicked sense of humor. We have a god who cooks and a priest with a harem. The book has two distinct magic systems with hints of other esoteric practices just over the horizon. Readers will have a grand time imagining themselves as powder mages; snorting gunpowder and guiding flying bullets. 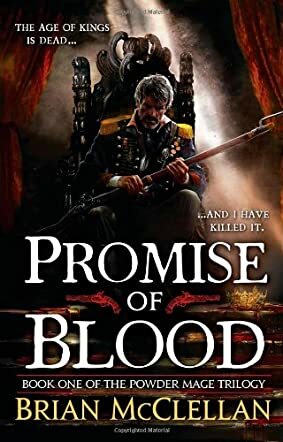 An all around fantasy adventure that rejuvenates the genre's tropes instead of just recycling them, the Promise of Blood definitely delivers. If Mclellan keeps this up, Brandon Sanderson, Joe Abercrombie and Brent Weeks better watch out.